You're on a cruise ship that only stops off for a short time, you're here for work reasons or you've just had a bit of a lie-in at the hotel. Sometimes you only have half a day to discover Antwerp, and a lightning tour is the only option. 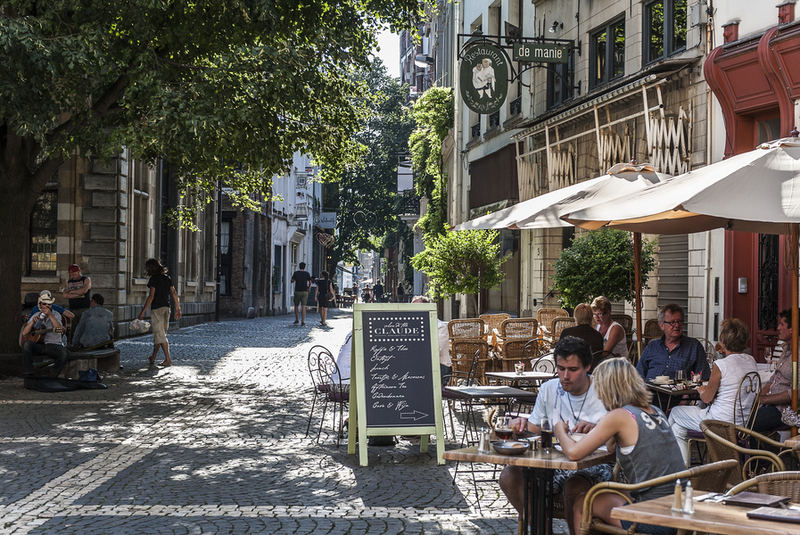 With these tips, you can make the most of your short time in Antwerp. And we bet you’ll be back soon for an extensive visit! We start at the centrally located Grote Markt. Pop into the Visit Antwerp visitor centre there and ask for your free city map. You can take some great photos at the Grote Markt. The real eye-catcher in this square is the 450-year-old Town Hall. The statue of Brabo is also worth seeing: it tells the story of the hero who, legend has it, took on the giant Antigoon and liberated Antwerp from his control. During the summer months, this statue changes into a genuine fountain. Don’t miss the various old guild houses, either: admire their beautiful façades and the gold-coloured statues that top them. From the Grote Markt, it’s just a quarter of an hour’s walk, for example along the quays overlooking the Scheldt, to the MAS|Museum aan de Stroom. Take the escalators to the tenth floor and go out onto the roof terrace, where you can enjoy a stunning 360-degree view of Antwerp. From the MAS, walk another ten minutes in the direction of the city, past the Academy of Fine Arts. A few streets along you will come to a southern-style square. Hendrik Conscienceplein with St Charles Borromeo’s Church is a visual delight, so sit down for a while and soak up the scenery. Had a good rest? Then walk towards the railway station via St James’ Church, which contains Rubens’ burial chapel. Many people regard the monumental Central Station as one of the world’s loveliest railway stations. It’s definitely worth stopping to admire. Got some energy left? Then make your way back to the Grote Markt and follow the numerous shoppers to the Meir, the city's largest shopping street. This will take you past the unique Stadsfeestzaal shopping centre, and a little further along you will see the Boerentoren, the oldest skyscraper in continental Europe, towering over the city. Before returning to the Grote Markt, discover the 123-metre-high Cathedral of Our Lady. It’s the largest Gothic building in the Low Countries, and among other treasures you will find works by the Baroque painter Rubens inside. Admire the imposing west front and experience the touching statue of Nello and Patrasche. You wouldn’t want to leave Antwerp without a nice souvenir for the folks back home. There are several shops in the area, but the Stadswinkel in the visitor centre on the Grote Markt has the best range. You’ll find books, postcards, delicacies and much more. Share your photos on social media with #visitantwerp and let the world join in the pleasure of your trip to Antwerp. So dazzled by beautiful Antwerp that you’ve lost your bearings? Use Antwerp’s free Wi-Fi service to find your way back quickly.